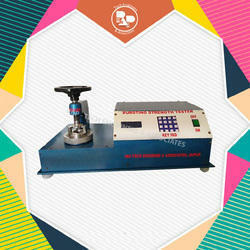 Pioneers in the industry, we offer Bursting Strength Tester such as Bursting Strength Tester Dual Clamping, Microprocessor Bursting Strength Tester, Digital Bursting Strength Tester, Quadrant Scales, Microprocessor Based Tensil Strength Tester, Paper Moisture Tester and many more items from India. 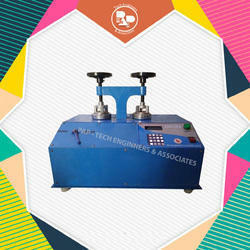 It has two Diaphragm Seats & Selector switch to select either paper testing or board testing. One to accommodate thin rubber diaphragm for testing materials of low strength value like paper, etc. and the other to accommodate moulded rubber diaphragm for testing materials of high strength value like corrugated board, etc. Two Handles having 0 to 7 Kg/cm & 0 to 35 Kg/cm. This instrument has dual range of clamping and diaphragm. It is provided with Microprocessor control and it can be attached with computer and printer. 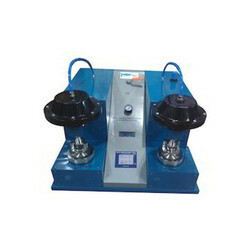 It is used for both Paper and board and is known as Microcompressor Double Headed Model. Packaging Details: The prices mentioned are net and ex-works, Jaipur basis and are exclusive of : (A)	Packing & Forwarding Charges @ 3% (B)	Insurance & Freight to be covered by the buyer. (C)	GST : 18% 100% advance against Performa Invoice prior to dispatch. We will go for an Annual Maintenance Contract on basis of service charges after sale. 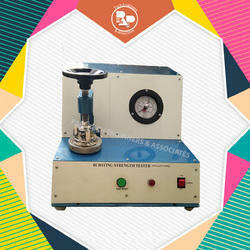 Bursting Tester with Pneumatic Clamping (Compressed air to be provided by user) & Auto Release of the sample. It is suitable to test Paper & Board. Incorporates Microprocessor based control panel with printer port facility. Digital Fully Automatic Bursting Strength Tester is produced is produced through electric motor and gear to avoid samples slippage under fully automatic control for Manual clamping of specimen & Digital Display. Fully automatic Bursting Strength Tester with printer determines the Bursting Strength for the Quality Control and Research & Development of paper, board and corrugated board. A test piece is clamped between two concentric plates each having circular opening in the center. Pressure is applied to the under side of a test piece by a rubber diaphragm, which is expanded by pneumatic pressure. Salient Features Heavy Duty Cast Iron body. Motor suspension in rubber cradle. Wheel with screw actuates the raising and lowering of the upper clamp. The Bursting Pressure, at the time of rupture is recorded on a sensitive pressure gauge. All pressure gauges are statically and dynamically calibrated. Two pressure gauges are fitted as standard. Units supplied with 'C' spanner, spare diaphragms, one alluminium foil and glycol topping- up fluid. Opening In Lower Clamp 31.50 mm +- 0.05. Opening In Upper Clamp 31.50 mm +-0.05. Pressure Resolution 170 +-10ml -min. Lazy hand (maximum Printer) for maximum burst reading. Switch from one head to another by a simple switch. 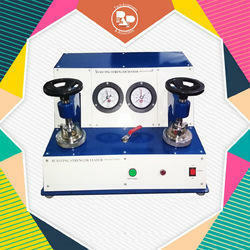 Pneumatic Bursting Strength Tester with printer determines the Bursting Strength for the Quality Control and Research & Development of paper, board and corrugated board. A test piece is clamped between two concentric plates each having circular opening in the center. Pressure is applied to the under side of a test piece by a rubber diaphragm, which is expanded by pneumatic pressure. Opening In Lower Clamp 33.10 mm +- 0.05. Opening In Upper Clamp 30.50 mm +-0.05. 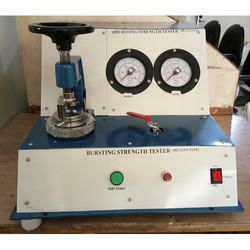 Digital Bursting Strength Tester determines the Bursting Strength for the Quality Control and Research & Development of paper, board and corrugated board. A test piece is clamped between two concentric plates each having circular opening in the center. Pressure is applied to the underside of a test piece by a rubber diaphragm, which is expanded by hydraulic pressure. 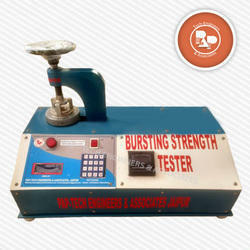 BURSTING STRENGTH TESTER (MICROPROCESSOR BASED) Control and it can be attached with computer & printer. Uniform Hydraulic pressure is produced through electric motor and gear to avoid samples slippage under fully automatic control for Manual clamping of specimen & Digital Display. It is used for strong Kraft board , Solid Fibre & corrugated board. This instrument has Dual Range of Clamping and diaphragm. It is provided with Microprocessor Control and it can be attached with computer & printer.